When you get deeper into the tabletop gaming hobby, turns out its more than just fun and games. It’s conventions too! 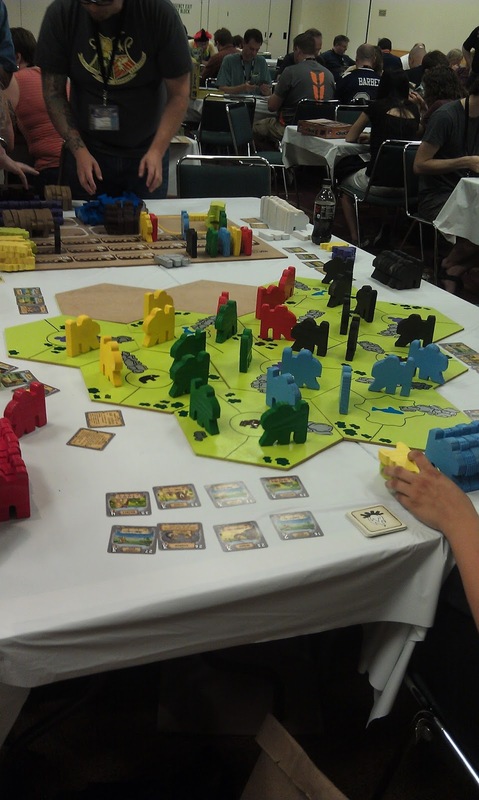 One of the biggest boardgame-centric conventions in the world – and the biggest in the US – happens every year at the beginning of August in the city of Indianapolis: GenCon. If you’ve never attended a convention before, Gencon can be quite overwhelming. There is a whole lot to do and see, and it’s hard to figure out even where to start. But, if you’re interested in exploring games further, Gencon is a great opportunity to try out new games, get your hands on the latest releases, get some classics for free, interact and meet other fans of the hobby, and much much more. This guide should help you get started. The first thing you need to do is get into the convention. There are a few different types of tickets and badges. Badges are what you need to get into the convention itself. You need a badge to access all the main rooms – the dealer hall, auction room, events, etc. Badges come in 1 day and 4 day formats. If you’re going to attend at least 2 days, the 4-day badge is worth the cost. You can order tickets online, but if you’re going to do that it’s best to do it in May and early June, to get a early registration discount. After that, the price hikes $10. Ordering online will hit you with handling fees, so even with the price hike, buying at the door will only cost you a couple extra bucks. Buying online can also help speed up the process of going through the line to get your badge. If you order early enough, you can get it shipped to you, otherwise you can pick it up at Will Call – the past few years have seen the convention get much more efficient at processing Will Call tickets, but you’ll still get lines near opening time on thursday and saturday. If you show up early, or come on friday to get your tickets, you’ll have a much shorter wait (if any at all). Early is around 8:30, 9am. Tickets are different than badges. Tickets come in the form of “generic” tickets, which act as sort of a psuedo-currency for events, and specific tickets required for specific events. You may or may not want any of those; in fact, if it’s your first time at the show, I recommend skipping out on events entirely. There’s plenty to do, and having less pre-scheduled will give you the freedom to jump on things you discover while you’re there. I’ll talk more about tickets and events below. This is the main attraction; the core of Gencon. This hall is enormous and filled with hundreds of publishers, designers, and artists. Here is where you get a chance to demo new games and purchase the latest and greatest. You’ll find retailers offering product at deep discounts. You’ll find rows of dice and miniatures and all sorts of fantastic things you never imagined would exist. The best way to hit up the dealer hall is just to wander around and when you see something that interests you, take a closer look. It’s not a bad idea to have an idea what you want to try out ahead of time. This list on BoardGameGeek has a pretty good list of what NEW games will be launching at the convention: http://www.boardgamegeek.com/geeklist/153611/gen-con-2013-preview. Most publishers have demos of their more popular games as well, so if there’s something specific you want to try, make yourself a list. There’s certainly more to see than what’s on that list, so make sure to walk around the hall even if you have specific stops in mind. Not to mention all the non-boardgame-publishing kiosks you’ll find, from artists to dice to costumes. If you’re looking for Rio Grande games, they tend not to have a booth inside the dealer hall. While they have stands selling their games, there’s always a Rio Grande room outside of the dealer hall that is, in fact, completely free – you don’t even need a badge to enter. In that room you’ll be able to try most of Rio Grande’s major lineup, especially Dominion, although you may have to wait in line for a table. Lets face it – you’re going to be tempted to bring a bag of your favorite games. But you’re also going to be picking up some new games and supplies. You might be making trades. You might have a planned list but find something unexpected. Whatever happens, you’re going to want to avoid having too much stuff to carry around. First of all, having a heavy pack fill with games is going to get exhausting. Secondly, in a crowded area you’re going to want to take up the least amount of space that you can, to avoid bumping, crushing, knocking over, or otherwise being rude to other attendees. Try to keep your carry-ons to a minimum. Plan trips back to your car (or hotel room or whatever) to unload piles of games. There are lockers, but you have to pay $1 to lock them (every time you open them) and they are in high demand, so good luck getting your hands on one. If you’re looking for some great deals on classic games or gaming merchandise, make sure to check out the Auction room. Even if you prefer not to sit around all day waiting and bidding, you have a few options. First of all, you can look through all the items that are up for bid, and I believe you can get a general idea of when that item will be up for auction, to give you a narrower time range to check back into the room. You also have the Auction Room Store, which has deals on all the items that do NOT sell, and a few items generously donated by publishers. The prices on these items shrink the closer you get to the end of the convention, but if you find something awesome, it might get snapped up early. You might discover a hidden gem or find something really cheap worth trying out. You never know. 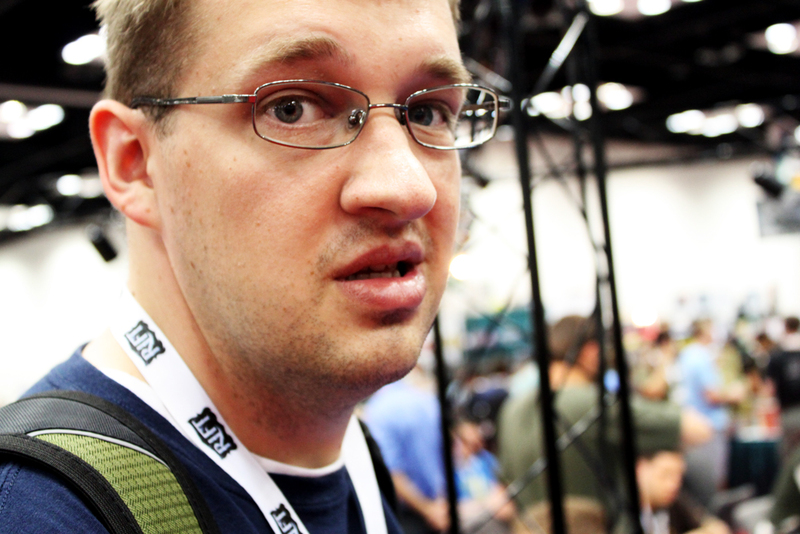 FarmerLenny is definitely excited about Gencon. There are numerous panels involving industry insiders, geek celebrities, and more, talking on a variety of subjects. I’ve attended a few panels, mainly those featuring Wil Wheaton, and there’s not much direction to give here. Just be aware that they exist. You can find lists of them on the Gencon website and in the program book you receive with your badge and SWAG bag, so make sure to look through those to see if any interest you. As far as I am aware, panels are usually free as long as you have a badge. You may want to show up a few minutes early if you do decide to attend a panel, as popular panels will get crowded quickly. There is a room where you can borrow one of hundreds of games and have a table and the ability to play unhindered for hours at a time. You also have to pay to get it. While it’s nice that this is an option, chances are you’re going to be getting your hands on new games of your own and more excited to try those. I’ve found that there are plenty of places to find tables out in the random hallways. While you can’t reserve these and it’s more of a first-come-first serve kind of thing, I don’t see much of a point in paying for a table in the Game Library. But if that interests you, now you know it’s there. If you have a bunch of games that you no longer play, trades – and especially math trades – are a great way to pass them along in exchange for something new (to you). But shipping costs can add up. Fortunately, no-ship math trades allow those trying to avoid shipping costs to get in on the action. No-Ship math trades are organized under the assumption that everyone is either local or will end up in the same place at the same point in time. The place and time in this case is, of course, Gencon. It’s too late to participate this year, but next year you can watch out for it. The meetup is always (or at least has been for the last 3 years) at 10am on saturday, and everyone in the math trade attempts to meet up and do a massive, chaotic exchange. It’s fun and its a great way to pass along those games without shipping costs. (Don’t worry – there are rules in place that ensure if someone bugs out on the meetup and you can’t arrange any other time, it becomes the flake’s responsibility to pay for shipping if necessary). There are a HUGE number of Events, capital E, at Gencon. What are Events? They are specific, pre-planned games with reserved tables. There are events for almost any game you can think of. Some events are tournaments, some are simply a chance to play one of your favorite games with guaranteed opponents and table time. In general, you have to register for an event, and they fill up fast. Many events require specific tickets for that event, which you have to purchase. Like I said, those go fast so chances are you won’t get your hands on any this late in the game. 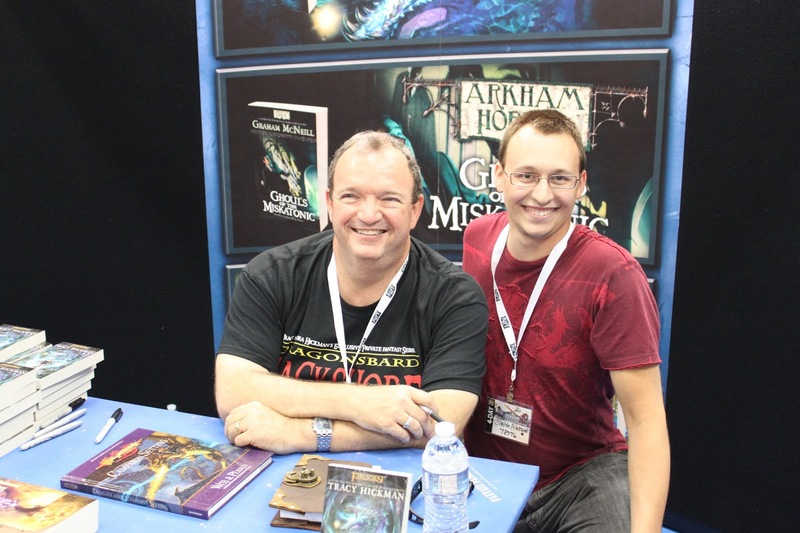 The Gencon website has more information. There are events that you can just show up at, and these events require what are called “generic tickets.” These tickets cost $2 and can be used for any event. They’re essentially an intermediate currency – if you want to do an event that costs $10, you need 5 Generic tickets to get in. These events are generally on a first-come first-serve basis. There are so many events it’s really impossible to give you any specific tips on any of them. The best way to find events is to look them up on the Gencon website. You can search keywords, game systems, days, times, etc. etc. and so forth. Tournaments can be fun to participate in, or maybe there’s a game you love that you don’t get to play often because it doesn’t fit your normal gaming schedule or your gaming group’s tastes. Events are your chance. This should go without saying, but… c’mon guys. There are a lot of people packed in the convention. People are wearing costumes. People are carrying boxes of games around. Be courteous and respectful. Don’t push people. Don’t touch people who don’t want to be touched (and start with the assumption they don’t want to be touched). Be aware of where you’re walking and where your bag of games is swinging around. Ask permission before taking pictures of anyone in costume. Use good hygiene. Brush your teeth, take a shower, use deodorant. 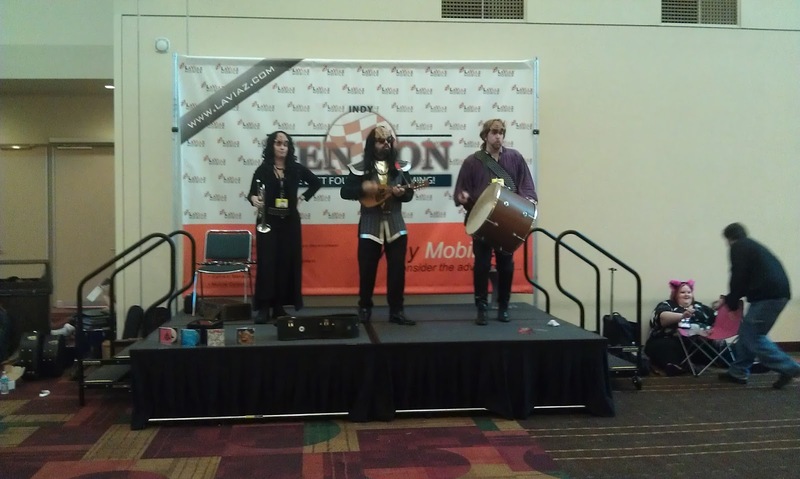 There is a whole lot more going on at Gencon than I can possibly fit into a short article. Like anime? video games? dressing up in costumes? LARP? There’s a place for you at Gencon. The program book and the Gencon website will be very useful in finding out what sorts of things you can do, and there’s a lot of it. If you are on twitter, chances are you’ve connected with some other boardgame fans. Chances also are that some of them are attending Gencon. Twitter is a great way to connect with people at the show and arrange meet-ups, but if you don’t have a smartphone or easy access to the internet in some other way, you’ll want to get phone numbers or arrange meetings beforehand. Find a table. Get your friends together (hopefully you either brought friends or planned to meet up with some there). Play some games. There’s a ton of space and plenty of games to be found. This is your chance to play games, to get others to try something new, and to try new things yourself. The best way to get the most out of Gencon is to do what you feel is fun. Don’t feel like you have to visit every room, try every game, participate in every event. Don’t overwhelm yourself with too packed a schedule. Hang out with friends, play some games, and have a good time.